This standing Bodhisattva is distinguished by the attributes of the conch shell in his right hand, and a book placed on top of a lotus stem clasped in his left. He is crowned and adorned with jewellery and princely garments. The conch shell, which is called the conch of the Dharma, is the principal attribute of Vajrabhasha, one of the sixteen Bodhisattva attendants of the mandala for Vairocana ; however, usually Vajrabhasha's sole attribute is the conch shell. The book is principally associated with Manjusri, the Bodhisattva of Wisdom. In one aspect of Manjusri, he holds his right hand extended in varada mudra, the boon-bestowing gesture, while a lotus is held in his left . Here one may interpret the book and the conch as a symbolic doubling of attributes, joined together to reinforce the emblematic powers attributed to the Bodhisattva. The book represents the sacred Buddhist teachings, while the conch represents the call to prayer of the monastic assembly and the transmission of the teachings. The claw necklace pendant worn by the Bodhisattva may also be associated with different aspects of Manjusri, though it is not exclusive to him . 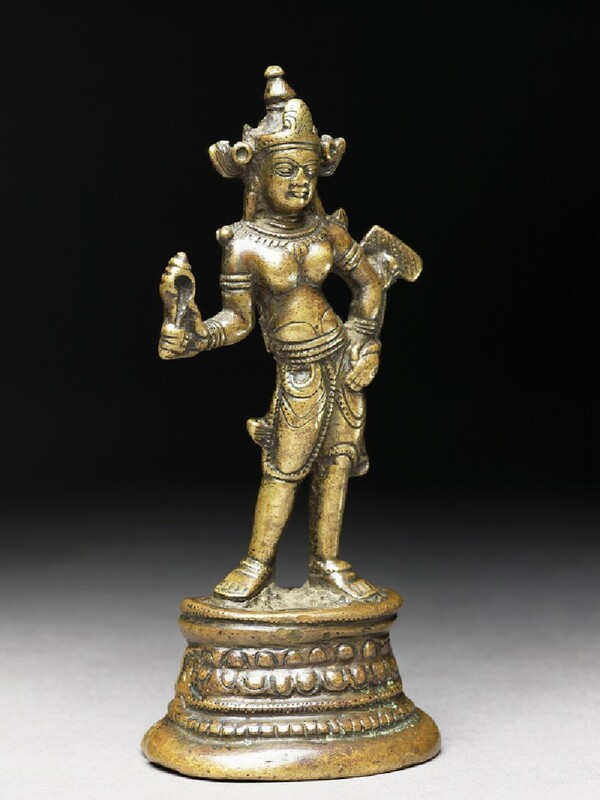 Thus it may be tentatively suggested that this standing Bodhisattva is an aspect of Manjusri. One must recall that, although at present there is no specific ritual text extant describing this deity, it is not impossible that this iconography was made to represent a ritual composition which has subsequently been lost. This hypothesis is reinforced by the style of the statue, which reflects the period of the revival of Buddhism in the Western Himalaya and Western Tibet. A number of iconographies developed at this period were later discontinued . The statue has a similar scale, slightly awkward position, exaggerated tribhanga, and very straight legs associated with this region, as seen in the Avalokitesvara figure (cat. 38). 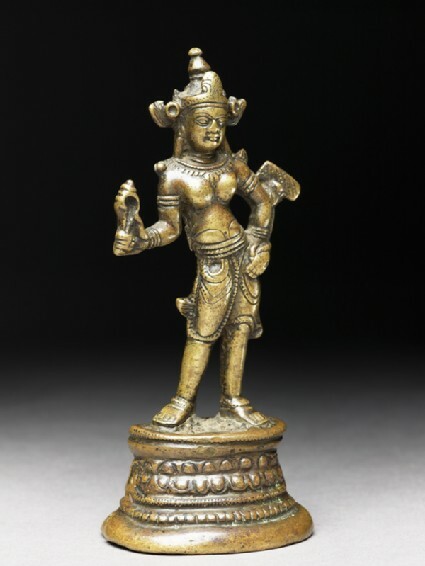 Von Schroeder has identified a group of brass, non-gilt sculptures with a similar straightforward glance of the broad face, and the extended fabric lappets of the crown, as being of the Tibetan monastic period, in the eleventh to twelfth century . The lack of gilding and the colour of the alloy, suggesting a low proportion of copper, tend to reinforce this attribution. The statue and its base were cast separately. The multi-tiered base with large beading and non-aligned lotus petals was popular in Pala India in this period, reflecting an eventual influence from Indian artists working in Western Tibet and the Western Himalaya during the eleventh century . This accomplished image harmoniously blends the Western Tibetan and Pala influences. 1 de Mallmann, Introduction a l'iconographie du tantrisme bouddhique, p. 57, for Vajrabhasha in the Vajradhatu mandala, and p. 60, for his presence in the mandala of the Dharmadhatu-Vagisvara Manjusri. 3 This claw necklace is also worn by an eleventh-century Bodhisattva, perhaps to be identified as Maitreya due to the stupa in his crown: see von Schroeder, Buddhist Sculpture in Tibet, vol. 2, p. 919; this necklace is discussed by de Mallmann, loc. cit. 4 See the statue of a seated Kalachakra attributed to the western Himalayas, eleventh century, in Reynolds et al., Catalogue of the Tibetan Collection of the Newark Museum, p. 65. In the ritual anthologies later codified, Kalachakra is exclusively standing, not seated. 5 von Schroeder, op. cit., vol. 2, pls. 296-7. 6 See e.g. the bases of the late Pala sculptures illustrated in ibid., vol. 2, pls. 282A and C. See also Introduction above, for Indian artists working in Tibet during this period.